It is Good Friday today. 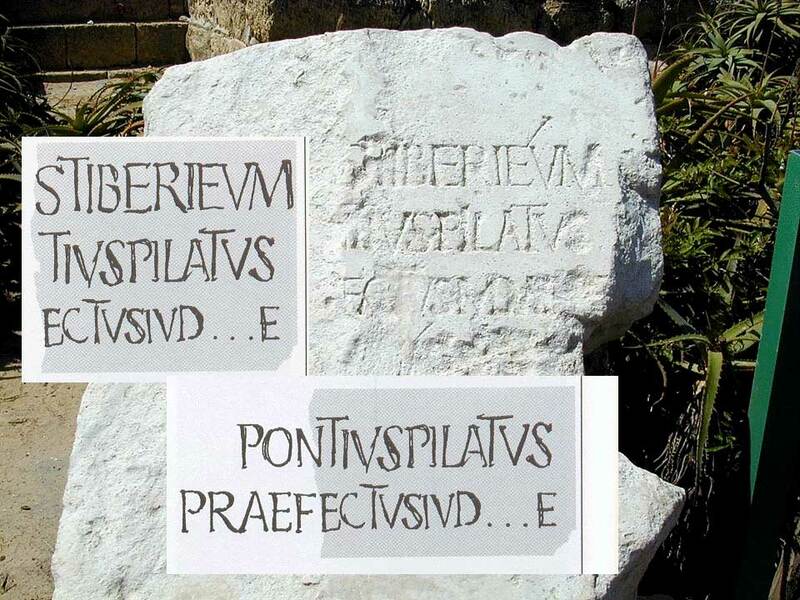 By chance I found myself looking on Twitter at a picture of the so-called “Pilate stone”. This is the inscription which mentions Pontius Pilate. Most of us will be familiar with its existence, but it seems appropriate to gather some of the information about it. In 1961 an Italian expedition was conducting the third season of excavations at Caesarea. 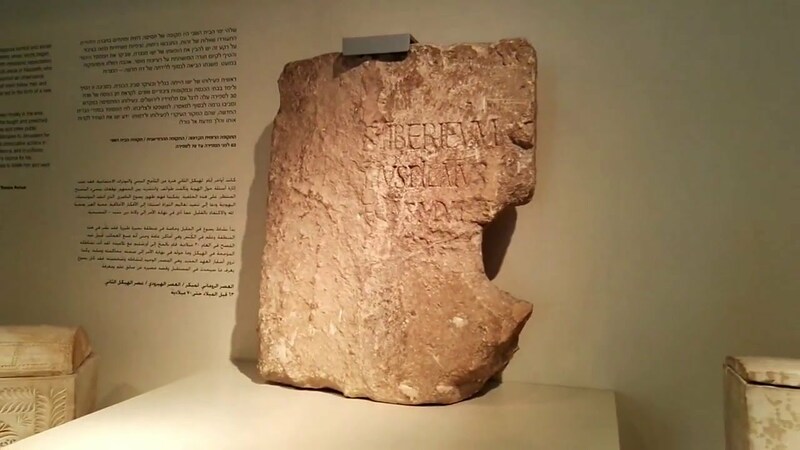 They found an inscribed stone in situ in the remains of the Roman theatre, where it was being used as the landing in a flight of steps which led up to the seating. The stone was placed there during rebuilding in the 4th century AD. In the process of reuse, the left-hand third of the inscription had been chiselled away. The stone is 82 cm high, 68 cm wide, and 20 cm thick. The letters are 6-7 cm high, and the spaces between the lines 3-4 cm. The inscription was published by A. Frova, L’Iscrizione di Ponzio Pilato a Cesarea, Rend. Istituto Lombardo, accademia di scienze e lettere, classe di lettere 95, Milan, 1961 (Pp. 419-34, 1 map and 2 plates), which I have not seen. It appears, I am told, in L’Annee Epigraphique in 1963 as entry 104 (ref: AE 1963 no. 104). A useful picture from the web shows this, with the possible missing text. Frova suggested that the starting “S” is perhaps the end of “Caesariensibus”. Also there is an acute accent – an “apice” -, just like the one over the E of Tiberieum, on the fourth line. This, it is speculated, belongs to an E, which perhaps was part of DEDIT, I.e. “he has given”. If we accept this, we would get us something like “To the Caesareans, the Tiberium Pontius Pilate, Prefect of Judaea, ?? has given ? ?”, I.e. Pontius Pilate, Prefect of Judaea, has given this Temple of Tiberius to the people of Caesarea. Sherwin-White remarked that this confirmed his own hypothesis as to the title that Pilate held. The title of Procurator was introduced by Claudius, and its use for Pilate by Tacitus and Josephus is perhaps simply a case of those authors using the contemporary title for a provincial governor, rather than one that had dropped out of use. 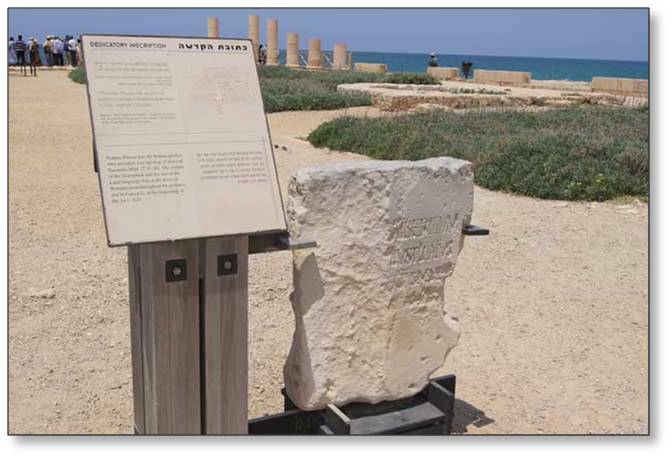 Josephus tells us (Jewish War I, 412; Antiquities XV, 336) that Herod built colossal lighthouses at Caesarea, the largest of which stood on the western entrance to the port was named after Augustus’ step-son Drusus, Tiberius’ brother. This then was the “Drusion”. Alfoldy surmises that the “Tiberion” was therefore another lighthouse, perhaps on the eastern entrance of the double port. A reproduction is at Caesarea. On which note, may I wish everyone a Happy Easter! Very interesting – many thanks! And a Happy Easter to you, too!